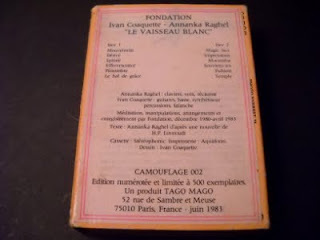 The final installment of my Fondation posts and the last musical release of both Ivan Coaquette (formerly of Spacecraft and Musica Elettronica Viva), who'd cease musical activities thereafter and return to his visual art pursuits and Annanka Raghel, whose trail after Fondation simply evaporates. 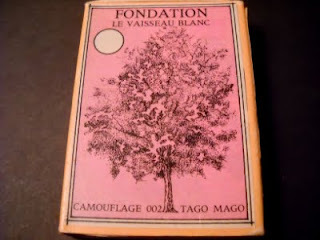 Issued on Pascal Bussy's amazing Tago Mago imprint in a retooled giant matchbox, this is purely of a piece with their previous releases, Le Vaisseau Blanc in some respects representing a last hurrah for this aesthetic dimension of the French underground scene, with hallucinogenic webs of delayed electronics and wetly effected guitars weaving vapor trails around one another in a manner directly descended from the Heldon/Lard Free school of dystopian cosmic rock. 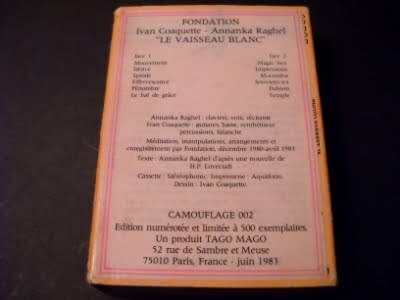 Thank you, I'm enjoying this a lot.